The total cost of the war is $25 billion (the 1919 domestic budget is $6 blillion, the bulk of the cost has been funded by bonds). The 4000 aliens that had been interned will be deported. the peace talks have started in Paris. Schools, theaters and churches are all opening in Greensboro, NC. 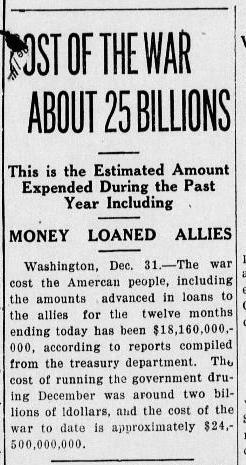 Source: “Cost of War About 25 Billions,’ The Daily Times, Wilson, North Carolina, December 31, 1918. Page 1, Column 6.